Blurb: Raj, a typical school boy from a middle class family, who was also born unlucky. Living with his aunt, he had a good life at school and great friends. But everything changed when a girl entered his life. Everything changed and he himself believed he was unlucky. His school life no more to be great and his friends no more trustworthy. After years of tragedy he meets his love and life doesn't stop being crazy. But how crazy is it going to be for Raj? 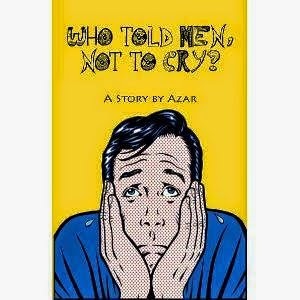 Verdict: ‘Who told men, not to cry?’ is the first work of fiction by Azar. This book is a light read which the readers might consider as a one-time-read. The cover looks good and bright. The yellow color is bright and would definitely attract eyes. The name is good but not that impressive. The author could have put some more effort in choosing a more appealing name for this book. The blurb seems to be a bit dull to me and I can’t say that all readers will go for the book after reading the blurb. The blurb indicates that the book has nothing surprising and new. Which I liked about the book is its size and quality. It fits perfectly in the hand and the readers will feel comfortable holding this book. The story starts on an ordinary note with the main protagonist Raj recalling his story. The story moves on with Raj being a nerdy, studious guy spending some good time at school with his few friends until that fateful day when Keerthi, the female protagonist enters the story and every one of his friends started drooling over the new girl in the class. The story goes on Raj leaving his old school and friends after some incident and shifting to a new school to begin a new journey. In the new school, the readers comes to know that Raj is a good athlete too. The competition among the students and the loose ends left by the author at the beginning of the book will make the readers complete the book. For me, the best part of the book was the end. The end was unanticipated and came with full drama. The readers will love the end and will close the book in a happy note. The characterization was not so good and the direct narrating style had only made the matter worse. The characters were missing necessary description and the narrating style lacked the focus on the supporting characters. The author was so busy with Raj and Kreethi, that maximum of the characters lacked the limelight. I always believe if the book starts well, it will create an instant effect on the readers. The very first sentence of the book has grammatical errors which brings the readers down. Not only the first sentence, but the whole book needs a round of editing badly. One more thing I didn’t like about the book is the author’s consistent effort to inject laughter through the conversation which wasn’t working. It is the end that will make the readers feel good about the book. I hope the author will come with a better novel next time. Final Words: The author has tried to pen down a light read and somehow has succeeded to do so. A simple narrating style and a twisted end is what this has in store for the readers. Title: Who Told Men, Not to Cry? Thank you Timid fingers team.